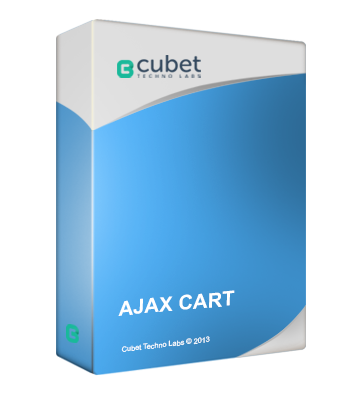 AjaxCart is a magento module which enables the user to add the products to the cart through ajax and avoiding the need of redirecting the page. After succesfull completion of adding a box is pinned to the top of the window showing the product is added to the cart and link to go to the cart and to close the box. This box will be automatically closed after 10 seconds. There will be alert showing that the quantity added to cart is not available if the available quantity is lesser than the added quantity.An admin panel settings is available if any integration with respect to the class names and ids in the core template is changed to the them currently used. 1. Saves the time for redirection. 2. A better look for the magento. 3. A stylish box for the success message. 4. Integrate in other themes easily. 1. Go to admin panel, system->configuration. 2. From the left panel click 'Ajaxcart Setings' from the 'Cubet Settings' menu. 3. Under 'Ajax cart settings' give custom values used in the template. 4. 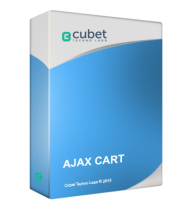 'Enable Ajaxcart', this is to enable the module and disable it. 5. 'Class name of top link cart anchor' , here enter the class name used for the anchor tag which displays the cart count. 6. 'Class name of cart button' , here enter the class name used for the button for adding to cart. 7. 'ID of wishlist form' , here enter the ID of the form in the wishlist page where all the products in the wishlist is displayed. 8. 'ID of Product form' , here enter the ID of the form in the product page where the details about the product is displayed. 9. 'ID of configuration div' , for configurable products there are congigurations availble to each product, here in this field enter the ID of the div used for displaying the configuration list. This settings should be entered carefully and with a little technocal knowledge of HTML. 1. Install the module using magento connect. 2. Go to system->Magento Connect->Magento Connect Manager. 3. Upload the package of the module, when clicking upload button the module will be installed. 4. Clear the magent Cache after installation. Only jquery and ajax is used in this module. A special script file is included for avoiding the conflict with the prototype js. This module saves time for redirecting after the product is added to the cart. It gives a special attraction to the magento site. Click the button below to add the Ajaxcart to your wish list.